Depending on the type of problem found, sometimes glasses can help. If glasses won't solve the vision problem, then vision therapy is needed. Vision therapy is much like “physical therapy,” but rather than treating the muscles of the body, it works on the eyes and visual system. It is an invaluable tool that has changed not only our patients’ vision, but has improved many related areas of their lives as well. 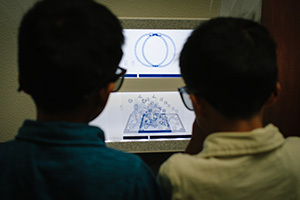 The first step of a vision therapy program is a thorough evaluation to determine if vision therapy is the best course of care. Having had extensive experience treating patients of all ages, our doctor easily makes our younger patients comfortable during this evaluation. Research has shown that vision therapy can be instrumental in helping increase visual attention spans for children learning to read. Often, children who had been falling behind in reading are able to improve their performance greatly by reducing the effects of their vision problems. 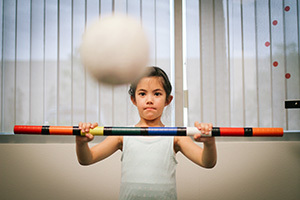 Vision therapy truly allows kids to enjoy learning and become more confident, productive and happier people. What Equipment Does a Vision Therapist Use? 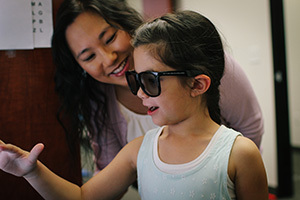 Just as a physical therapist might use treadmills or weights, a vision therapist uses hi-tech equipment, including prisms, lenses, filters, computerized systems, as well as a variety of other specialized equipment to conduct vision therapy sessions. 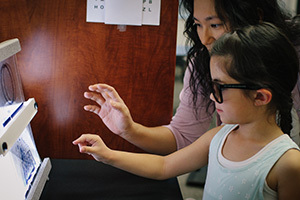 In our office, we use many interactive computer programs that our younger patients enjoy and that result in long-lasting success. Not only do the programs offer a proven, more effective method of delivering therapy, but the "fun" nature of the programs keeps children motivated to work, and thus, we find that results come quicker and stronger for our patients. How Long is a Vision Therapy Program? The number of office visits required depends on the diagnosis and the age of the patient. Vision therapy programs typically involve one to two in-office sessions throughout the week, for a varying number of months depending on need. We usually prescribe home exercises to reinforce office therapy. Is Vision Therapy the same as “eye exercises”, “Colored Lenses”, or “orthoptics”? There are a number of programs of "eye exercises" and techniques for improving vision that are not associated with Vision Therapy, such as colored lenses or programs advertised to quickly improve eyesight. Likewise, education therapy and vision therapy are not to be confused. We do not treat learning problems. We treat them only to the extent that an underlying vision problem is the cause of the learning issue. Once this sort of vision problem is treated, we may refer a patient to a educational therapist or tutor to help them with learning techniques.